THIRTY one million pounds sounds like an awful lot of money to spend on a fishing boat, but when you see the new Research, you could not say that money has been squandered. 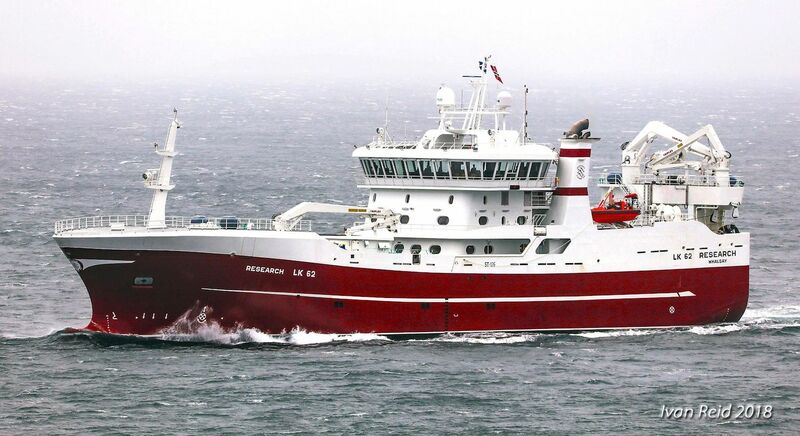 Research (LK 62) is the latest big beast to join the Shetland pelagic fleet, coming hot on the heels of the Serene (LK 297), that arrived last month. 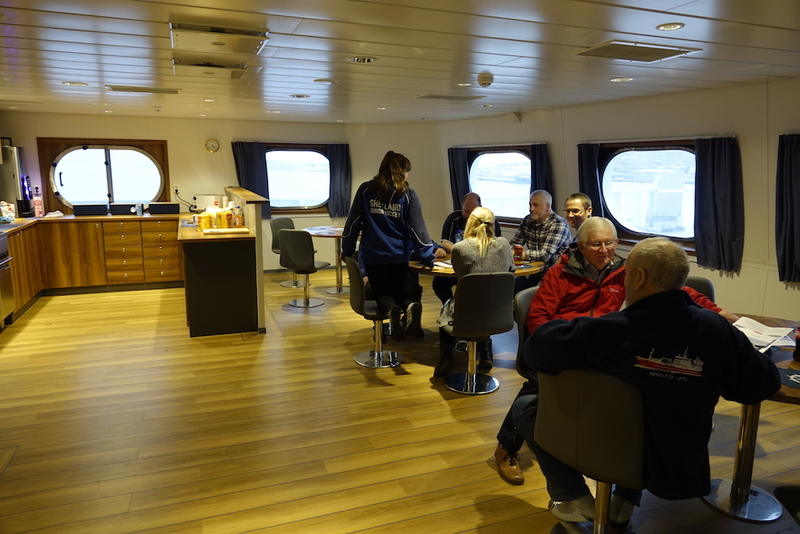 She was at the Shetland Catch pier on Saturday allowing a good crowd of wellwishers the chance to check out the impressive ship, which is equally as well appointed in her galley, messroom and bunkroom areas as the working arrangements. 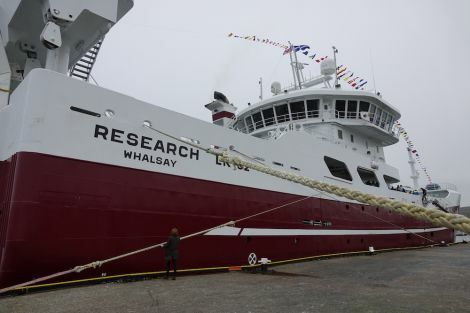 The 80m long Research is the latest in a long line of Whalsay based vessels to bear the name, but she is packed with a host of new features and ever increasing technological sophistication and sports sleek and distinctive lines. Operating with 15 crew, who are normally 10 on, five off, she will be full-manned till Christmas to give everyone the chance to learn the ropes. Research is planned to set sail for a shake down trip to the herring next weekend if all goes well. Skipper Gary Williamson said that the boat handled her rough trip back from the Vard Langsten yard in Norway with aplomb. She put on a turn of speed leaving Norway but was eased off to 10 knots mid-North Sea when she began to hit the gale, arriving in Whalsay on Friday. After a wheelhouse watch from 12 to 2am, the skipper had gone to bed and rose at seven where he could not believe what a poor day it was when he opened the curtains. Gary said: “It was gusting up to about 45 a lot of the time. She really behaved like the model in the flume tank did. The old boat [now fishing from Faroe] was an excellent boat to fish on, but this one is a splendid boat. I find her a bit daunting to begin with, but she is very easy to manoeuvre, easier than the other boat. Research is only a metre longer than her predecessor but considerably beamier at 16.2m. 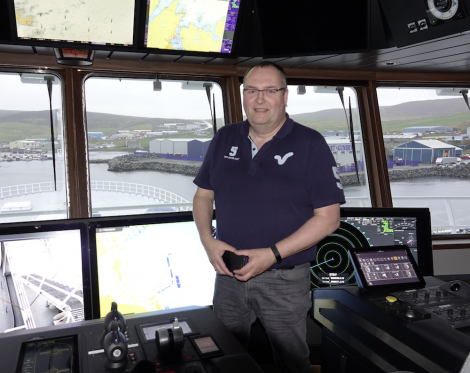 The vessel’s bridge is fully kitted out with a bank of large touchscreen monitors from where much if the machinery and the trawl controls can be operated, with three skipper’s chairs facing the array of equipment. It is the third Research to be designed by Skipsteknisk and the technology on board each succeeding vessel has been a quantum leap from its predecessor. Even with the usual spread of seats, sofas and tables, the wheelhouse could be described as spacious. Research’s winches were supplied by Rapp Hydema, and the nets and gear were to be wound on to the drums on Monday and Tuesday. Her trawls were made by Swan Net Gundry and Jackson Trawls of Peterhead. As well as one big mackerel net, she has three smaller “herring” nets that have done all the work for the past five or six years. “The fish has either been close in, or its been that lumps of stuff that you can handle a ‘peerie’ net far better when you’re among the fish. The herring nets are doing the donkey work now,” said Gary. When the vessel is ready for gear trials that will allow the technicians to set up parameters for the winches and power management system. Research will be pumping the catch onboard from the stern for the first time, an operation that Gary has never done before, but he has been told is “easy”. The fish is pumped through a large diameter pipe to the main separator forward of the bridge, where there is a sampling station for the size of catch to be monitored. Fish are then fed by a network of pipes to the 12 refrigerated seawater tanks, that can hold 2,800m3 of water, but in practice will take a maximum of 2,300 tonnes of mackerel. 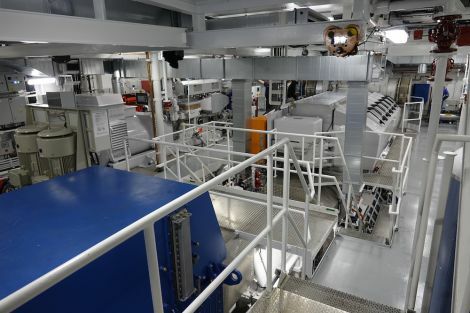 The tanks will only be filled like that in the New Year when the fish have firmed up and the long trips from west to the Norwegian factories are justified by large catches. 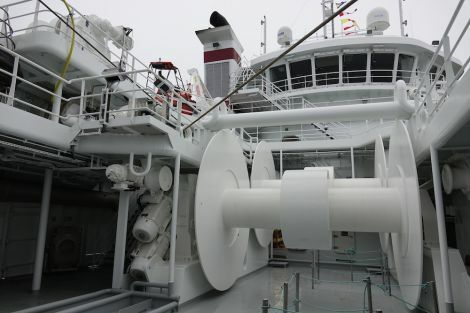 Catch quality has been paramount in the vessel’s design and the vacuum pumping system is driven by powerful electric motors that keep a steady pressure, eliminating hydraulic systems’ tendency to surge with the roll of the vessel and damage fish. “It’s a new design of pump that they’re come with, along with it being electric, so it will be interesting to see if it does improve the quality of fish,” said the skipper. Inside the RSW tank array is an impressive pump room where the pipe runs have been kept of regular length and any narrow passages eliminated to help maintain constant pressure throughout the system. Powering the whole works is a Wartsila 7,320kW main engine with a 3,400kW power take off. For harbour duties there are two auxiliary generators which can also power all the ship’s systems when she is completely dead in the water. 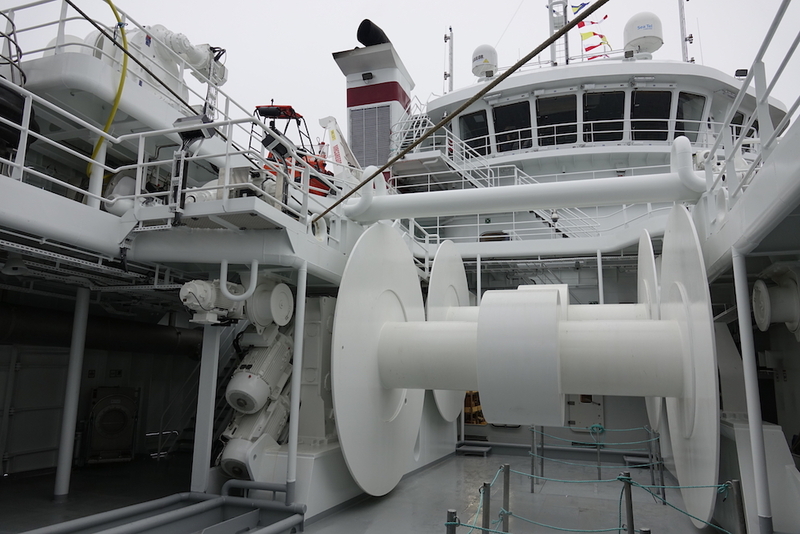 Adding to Research’s manoeuvrability is a fully retractable forward 1500kW thruster which can give the boat over 6 knots forward motion when the propeller is shut down to avoid tangling the net aft. This is in addition to a 960kW aft thruster. As well as Gary Williamson, the Research shareholders are second skipper Richard Williamson, first mate Harry Sandison, Jimmy Sandison, Alec John Polson, Alex Wishart, Michael Williamson and sister Wendy, who have a split share, and Arthur Williamson, who is uncle to the other Williamson shareholders, has a three-quarter share, having retired a few years back and sold part of his share back to the Research Fishing Company. Gary’s sons Bobby and Stuart are second mate and engineer on the vessel. Gary gives much of the credit for the Research concept to Richard, who was laid up for months with a badly broken leg following an accident when he decided to contact Skipsteknisk designer Karstein Teige to discuss the new boat. “Richard just wondered if he had any new ideas that he would like to put around so he sent him over a couple of plans and this is the end result of it,” said Gary.